Yesterday the Digital Billboard Art Project went live – a project where artists can submit images to be displayed on a public digital billboard. I have 45 images that are showing startinh yesterday, May 28th, and will run until June 24, 2012 in the Detroit Metro area (Macomb County), MI. I submitted slides about food – and made a series of images where foods are shown in both abstract and recognizable views, combined with words and slogans often used by advertisers to promote packaged food. A tomato with the word “SAME GREAT TASTE,” a papaya with the words “50% LESS FAT*” and images of rice, soybeans, a peach, and cheese are in the series. Each of the food featured in the series has an interesting story related to genetic engineering or modern farming practices. I am interested to have the images show in Detroit, a city where it is reported that over half of the residents do not have easy access to nutritious food. If you live in the Detroit area you can see the billboard in Utica, facing west and can be seen by traffic traveling east bound on Hall Rd (M-59). The billboard can also be seen from a parking lot shared by Muldoon’s Restaurant at 7636 Auburn Road and the Utica Fire and Police Department. My pieces are 7 minutes of the entire 24 hour loop – and will be seen at : 1:09 AM, 3:29 AM, 5:49 AM, 8:09 AM, 10:29 AM, 12:49 PM, 3:09 PM, 5:29 PM. 7:49 PM, 10:09 PM. 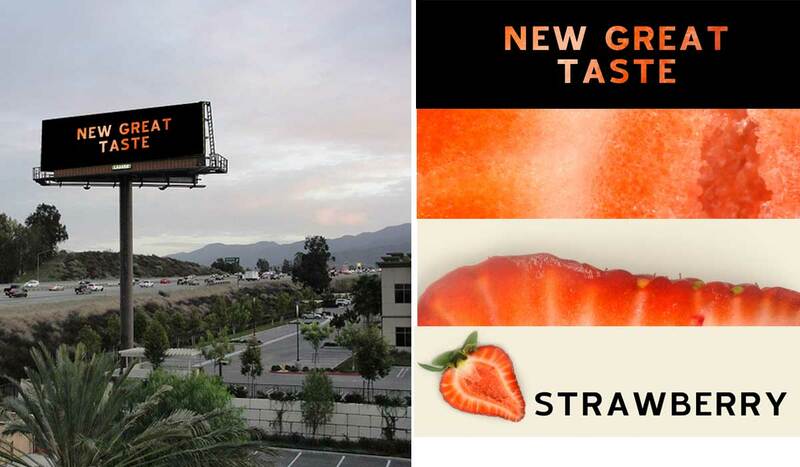 The Billboard Art Project is a project that acquires digital billboards normally used for advertising and repurposes them as roadside galleries – showing images from artists. Types of work that may be displayed include images created specifically for the billboard as well as images of previously made art adapted to the format. No two Billboard Art Project shows are alike; each city features new work. This year upcoming shows include other locations such as Richmond, VA; Salem, OR; Albany, NY, and Atlanta, GA. The Detroit show is unique in that the images will be up in a month. Documentation of the billboard is not up yet – I will post when the roadside photos of the Billboard Art project are posted in Flickr.